Vitreous floaters are any spots or shapes which move back and forth with eye movement. Floaters are very common and can arise from a variety of conditions. New onset floaters should always be checked to ensure there is no tear in the retina or signs of other disease. Floaters may be from blood, cells from underneath the retina, inflammation, asteroid hyalosis, from a PVD or from condensation/changes in the proteins within the vitreous. Blood: Floaters from blood most commonly occur as complications of a retinal tear, diabetic retinopathy or a retinal vascular problem. Inflammation: Another term is uveitis. This is like having arthritis in the eye. Cells from the immune system (white cells) actually migrate into the vitreous and clump. Treatment of the inflammation doesn’t always resolve the floaters. Asteroid Hyalosis is a special benign condition where white specs normally accumulate in the vitreous. Very similar to driving through a snowstorm, these asteroid bodies often make examining the retina very difficult. Miraculously, most people with asteroid hyalosis don’t complain of floaters, but on occasion, some do. Posterior Vitreous Detachment: Change in vitreous proteins are probably the most common cause of floaters. A PVD causes floaters or a “cobweb” moving through your vision as the proteins condense or change in clarity. The floaters can disappear, become tolerable or annoy you to no end. They can blur or decrease your vision and cause glare. For the myriad of you in whom the floaters don’t disappear, you can get rid of them. Vitrectomy surgery is the safest and best way to rid yourself of the floaters. There are a few doctors who promote the YAG laser, but none are retina specialists. With vitrectomy, the bulk of the vitreous is surgically removed. We don’t need the vitreous. It’s a vestigial tissue (i.e. a tissue we need during development, but serves no function once we are born. Another example? The appendix!). The vitreous is similar to jelly fish…mostly water, but has some structure (that’s why you can catch a jelly fish with a net). With vitrectomy eye surgery, the vitreous gel, and floaters, are simply replaced with 100% water, or saline. It is my practice to consider vitrectomy if; 1) the floaters you see definitely move back and forth with eye movement, and 2) you understand the risks and benefits of surgery. I don’t have to actually “see” your floaters. The vitreous is usually optically clear to you, i.e. you shouldn’t see your own vitreous. As a doctor, everything in your vitreous, however, should be visible to me. Large floaters can easily be seen and identified to be the culprit, but this doesn’t occur that often. More often, I can’t see the floaters because they are either too small for me to appreciate or I simply don’t know which one is causing the problem. With vitrectomy, this is not necessary. I don’t understand why patients suffering with floaters have been discounted. There is a clear treatment available. The risks of the surgery have changed since vitrectomy was first invented in the 1970’s. The procedure has become much safer and is comparable to cataract surgery. Because of the inability of physicians to knowledgeably council their patients, there are too many myths and rumors about vitreous floaters and the treatment. I’ll be adding articles about risks and benefits of surgery, risks of cataract formation, etc. in the near future to help set the record straight. Thanks you for the info and continued support to us floater sufferers, you consistently amaze me with such a generous approach to our pain. This article and the ones to follow should clears many of the questions you so friendly answer time after time. BTW: Thinking of scheduling a webinar re: floaters. Would this be of interest to you? I live in Montreal, Quebec. I cannot travel to the United States. Do you have any clinics in Canada? Are you associated with any Canadian Opthamologists? I need a YAG surgical procedure on one eye, and perhaps even a vitrectomy. Do you have any recommendations and/or referrals? P.S. I love recieving your interesting and informative updates. You, and they are AMAZING!!! I am sorry, but my offices are located near Washington DC. I don’t have any offices in Canada nor any professional associations. BTW: Thinking of scheduling a webinar re: floaters. Your thoughts? Would that be of interest to you? Can you please comment on the risks of encountering Proliferative vitreoretinopathy (PVR) after a floater vitrectomy? From what I’ve read, this is one of the worst outcomes of reina surgery, with very low prognosis. This seems to be the biggest worry as far as I can tell. I had successful surgery (vitrectomy and buckle) to repair a minor retinal detachment 4.5 months ago. Is my risk of PVR in that eye near zero at this point? If I proceed with FOV on the other eye, what are my risks for retinal detachment given lattice degeneration in that eye, the fact my other eye had a detachment, and likewise what are my risks of PVR whether or not there is a detachment as a result of the POV? How long must one wait after FOV to know for sure the chances for detachment and PVR have passed? Risk of PVR is very, very small after FOV….certainly less than 1%. If there was no sign of PVR in your eye with the vitrectomy and buckle, I’d say your risk of PVR is presently zero. Proceeding with vitrectomy for floaters in the other eye is probably very safe despite the history of lattice degeneration and detachment in the other eye. Afterwards, you are probably safe after 4-6 weeks. BTW: Thinking of having a webinar re: Floaters, interested? Your explaination of the floaters is excellent. I have large floaters in my left eye and also am very myopic prescription -8 in both eyes. My sister and brother are similiar and had retina detachement. Will Vitrectory increase my chance of retina detachement? Can’t really tell or help without an examination. What type of treatment must I follow? Can’t recommend a treatment plan because I don’t know your exact condition. I’d recommend close follow up with your own eye doctor. My retina detached in January of 2012 on a Sunday. I had surgery on the following Tuesday . The retina had torn in two places.14 days later the retina detached again. I had to have a scleral buckle procedure. The detachment s caused me to be blind in half of my eye and I have double vision. I also had cataract surgery and another detachment that was corrected with laser surgery. I have extremely poor vision in my left eye from this and frequent pain, headaches. and very dry eyes. Both eyes are always dry now and my right eye has floaters the doctor is sleeping a close eye on.I am using Ristasis for the dry eye s.
Do you have any suggestions for my eye pain. I have to be able to read and operate a computer for approx 6 hours of my 8 hour shift. I’ m desperately seeking help with the pain and worry over my good eye with the constant floaters Im experiencing. I’m 51 years old and I have always been nearsighted. Now I can’t see close-up without reader’s. I can not assess your pain without examining you…too many possibilities. You’ll have to rely on your doctor. Make sure your doctor assesses the new floaters…especially with your history. Dear Doctor- I’ve read and i think you’ve said with vitrector tools you get within millimeters of the retina correct? How is this possible? I’ve heard the tissue likened to wet paper so how can you get so close without possibly touching and possibly tearing? I don’t doubt I just don’t know. Then I know the instruments are inserted on side of eyes so how do you access the lens side of the eye? Can you? I have heard some say that leaving some vitreous there lessens cataract risk? Is there true to that or just speculation? My optho has already dismissed the floaters so your the only one I have and thank you so much. I hope to see you soon. Happy new year! The retina does not move while operating. One can easily get the necessary instruments very close to the retinal surface. The instruments are introduced into the eye so they enter BEHIND the lens. It’s not clear that vitrectomy, performed only for floaters, causes cataracts…..not many doctors perform them. Having a webinar on floaters. Please sign up? Hello Dr. Randall, hope you are well. I will help out in any way i can, even though i never participated in a Webinar i will research how it works, so count me in Doc. Is ocular hypertension a problem for those of us considering a vitrectomy ? My normal pressure is from 21-28 and has been this way for years. My scans for the past 12 years indicate that my optic nerves and retinas are in good condition but my corneas are 20% thicker than average. My Doctor deducts 20% to arrive at readings closer to 20. I don’t have glaucoma but I have severe floaters. In my left eye they are especially bad and distort my vision, especially when looking at bright lights. From a distance I can see multiple images in my left eye due to the floaters. No. The two conditions are unrelated. You are NOT beyond help! When is the webinar on floaters? Weightlifting – proceed, no issues. Typically do NOT induce a PVD. No need. I have asked Chrissy to communicate via email. Please let me know if we can help in any other way. I live in Indiana and am seeing a retinal specialist who says he can do it but he wants me to keep making that 40-mile drive to see him to prove that I am serious. I suspect he hopes I’ll get used to the condition, after two years. Not happening. I am indeed interested in a webinar. Please keep us posted. 38 yr old male with (XLRS) congenital retinoschesis. bilateral retina detachment 25 yrs ago. Corrected with scleral buckle procedure. Has remained stable, however recently developed floaters, which are now affecting the focal point. Considering vitrectomy to remove floaters and HD lens implants, current px of 9.5. Should I consider the vitrectomy, or is there an increased risk of detachment or loss of acuity. R eye acuity at 20/50 corrected, and L eye at 20/100 corrected. Don’t want to mislead. Because of your circumstance, I’d prefer to examine you before simply “guessing” you’d be a likely candidate. 1. In my opinion, very routine. 2. I would not recommend a bubble in your eye……why? 3. Usually operate on a Friday. Fly home that weekend. I am hosting a webinar on floaters. Please follow the link to sign up? Have you heard of jetrea? What will it be used for? Should it help with tonic pupils after scleral buckle? Jetrea (ocriplasmin) is a drug which may induce a PVD and close macular holes. Nothing related to tonic pupils after scleral buckle. I have been suffering with severe eye floaters shortly after my LASIK eye surgery for four years now.. I am 45 years old and put my life on hold because of this . I am not able to drive safely anymore more with my family and put a stop to all sports I very much enjoyed. Every day is a great struggle from morning to night . I have no support from anyone and am very depressed . At point I see great comfort in death as for they will be gone also. If indeed removing the floaters would help you, why don’t you see a retina specialist and confirm the problem? We could also see you in Virginia! 1) From what I’ve read, you normally perform core vitrectomies. What’s your procedure in eyes with PVD, or partial PVD? Would you then just perform an “extensive” vitrectomy? Approximately how much vitreous (in per cent) can be saved in such cases, yet removing the floaters efficiently? I’m afraid that removing too much vitreous increases the cataract risk, since some research (e.g. by Nancy M. Holekamp) indicates that the vitreous consumes oxygen and protects the eye from oxidative damage. 2) I am prone to keloid formation. Is there a risk of keloid formation somewhere in the eye after a vitrectomy, e.g. where the ports were inserted? 3) What’s you procedure for long-distance patients? I personally live in Europe. If I decide to schedule a vitrectomy with you, how long should I stay in total, including consultations/examinations before and after the vitrectomy? Furthermore, would it be possible to cancel the vitrectomy (and only pay the fees up till that point), should I change my mind during an initial consultation? 4) Does the price of the vitrectomy include any kind of “insurance” with regard to short-term complications? For example, does the price include necessary treatment of retinal tears, retinal detachment, infection, etc., in the unfortunate case that such complications should arise? 5) Approximately how much would a vitrectomy be per eye, including all fees such as taxes, consultations, examinations, etc.? Please send me an e-mail. 1. If you have a PVD, easy to remove most of the vitreous. You really can’t do just a “core” if PVD has occurred. I don’t really believe in a partial PVD. If “subtotal” it probably only last for a few weeks. I try to leave the anterior vitreous alone to protect the lens, but I’m not sure it matters. 2. No. Ports inserted 3-4 mm behind the limbus. 3. Schedule surgery. It will be on a Friday. Arrive Thursday for exam in the office. We can cancel if needed. Post-op exam the next day on Sat. Many decided to go home Sat or Sun. Flying doesn’t matter. I’d like you to see your own doctor with 7-10 days after surgery. You are welcome to stay as long as you want and I can see you. I’ll ask Chrissy to contact you via email regarding procedures/costs. As I continue to pursue resolving this issue and embracing FOV a bit more, I came across the wikipedia page for floaters which someone noted had recently been expanded to address floaters in people younger than 40, and how what they perceive are not floaters and are located in the ‘premacular bursa’. This seems like a very different opinion and frankly a little contrived seeing as the sources cited are the three doctors who perform laser. While I know and agree with you that their practice is more than likely illegitimate, I was just wanted to ensure the small size and close proximity of the floaters relative to the retina is a) not a problem and b) not an added risk. Thank you Doctor, and I really enjoyed the webinars- very cool! Vitrectomy, in my experience, is quite capable of removing vitreous as close as a mm to the retinal surface. I wouldn’t expect this to ba problem at all. Thanks for the comments regarding the webinars. I think they are pretty cool. I want to thank you for taking the time out of your busy schedule and keeping the public so informed through your use of youtube. After having double cataract surgery in a small town in Pennsylvania followed by YAG surgery in both eyes my right eye became completely overwhelmed with floaters. It was absolutely debilitating and was best described by me as looking through tissue papered covered lens. My local eye doctor told me to live with it and see if it would settle down after a while. Well I lived with it from September 1st until January 31st when I had a vitrectomy. Dr. Wong, that vitrectomy never would have happened if I had not run across your youtube recorded surgery and the comments, questions and answers that followed it. Right up until the week of my scheduled surgery I was afraid to go through with it. But based on the information that you provided it reassured me over and above what my own surgeon did. I realize that the operation is a highly skilled and not to be taken lightly procedure, but you made it clear that there are times that it is necessary and should be done. I realized that in my case I had no choice and that at sixty years old I either faced the rest of my life with an eye that I basically couldn’t see anything close up with and just cloudy hazy distant site. Today I have 20/20 back and I’m very thankful to my surgeon but actually owe that first step to you. Thank you again. You have no idea how many people you are helping without realizing it. Congrats. I’m glad things worked out and I was able to help provide you with some worthwhile information. More and more doctors need to realize our patients (you) want to find credible health information on the Internet. What if more doctors did this? I currently see a retina specialist in the Houston, Texas area and have very large floaters which constantly move around in both eyes but is more dominant in my left eye. My doctor gave me the option of a vitrectomy removing the vitreous fluid along with the repair to the weakened areas in my retina and then injecting a gas bubble. I had a posterior vitreous detachment in my left eye back in 2000 and another one in my right eye in 2001, and on both occassions those were repaired by laser photocoagulation. I am severally nearsighted. My question is why would it be necessary to repair the retinal tears in both eyes if they have been lasered over 12 – 13 years ago and are still holding the retina together? What would the purpose of the gas bubble be in the vitrectomy other than possibly because the doctor would do some repair to the previously lasered areas in the retina? I agree, if once lasered adequately, probably not necessary. Some doctors put air/gas in the eye after every vitrectomy to “seal” the eye. I don’t agree with this. Dear doctor, Is it possible that astigmatism may cause floaters? Doctor am 30 years old suffer with floaters in the right eye three years, I am Brazilian and I can not visit him but I read your blog every day, I have a question for you. My doctor said I have a partial PVD why the cause of floaters, he referred me to vitrectomy, said he did not use gas and that will only remove the vitreous of the eye and that my chance of getting a cataract in the future is over 50% would like your opinion of it. I’m bodybuilding and MMA athlete will be able to practice the same sports after a vitrectomy? The chance of getting a cataract over your lifetime is 100%, that is, everyone gets a cataract….everyone. If there is a cataract at the time of vitrectomy, it will probably develop faster. Regardless, you should be able to continue bodybuilding and MMA! I have question about the treatment (removal) of a Weiss Ring and what is the difference between it and floaters in general? The Weiss Ring is in the center of my line of vision and does move in and out briefly. It’s not just a small annoyance but actually really interferes with my sight. Is there a greater risk of removing a Weiss Ring as compared to floaters with a victrectomy? Weiss ring should be thought of as a specific type of floater. It is a circular floater representing the attachment of the vitreous to the optic nerve (it’s round). Once the vitreous separates, one can often see this round opacity floating with the vitreous. In my opinion and experience….much easier to perform a vitrectomy after a PVD compared to removing floaters without a PVD. Are you aware of any connections between suffering from floaters and seeing starbursts, halos, and ghosting? One possibility is that the floaters are large enough to cause glare…possibly the starbursts, halos and ghosting. Cataract, too, could cause similar symptoms. Oops, I had another question. I have blepharitis. Does this mean that I am at a higher risk of infection? What precautions can I take? No. Blepharitis is not really an infection. I have recently discovered your website and am very encouraged by your position on floaters and vitrectomies. I was told that I have a partial PVD in my right eye, but in mid-December I elected to have a “core” vitrectomy based on my surgeon’s recommendations and reports of fewer complications vs. PVD induced procedures. My vitrectomy had mixed results, the lighter floater disappeared, but most of the darker floaters remained. It has only been a couple months, so I suppose there is a chance these floaters could fade. Though from what I recall these are the same floaters that were present pre-surgery, so I am not optimistic about them fading. My surgeon said they cannot see the floaters, but they are very apparent to me. 1. I believe it was stated in previous comments that you typically do not induce a PVD since it usually not necessary. I do not know how close my surgeon came to the retinal surface, not sure if it was within the 1 mm, you cited earlier. For a situation such as mine, would you recommend another, possibly more extensive, core vitrectomy, or a PVD induced vitrecomy? Or am I pretty much out of luck? 2. If another procedure is possible, what would be the recommended waiting time between procedures? It is hard for me to truly assess your situation because I can’t examine you. 1. You are definitely not out of luck. Consider a second procedure if indeed floaters are persistent. You might consider consultation with someone else. 2. If a few months have already passed….probably now is fine. I forgot to mention my age in case that has any bearing on your answers, I am 30. A PVD in your age group (you could be an exception and I haven’t examined you) would be surprising, but would explain why you may have residual floaters. I have floaters in the right eye three years, will my doctor of 6 in 6 months, 9 days, the doctor found a fragile area of the retina and laser applied to seal, much after the laser flashes all day in a row, Dr. said that this happens because the healing time of the laser, is this true? Recovery time he spoke 15 days? Not sure the visual effects are from the laser. Could be from the vitreous pulling on the retina? Doctor’m afraid to do vitrectomy, I’m afraid to leave the operating room and go blind or get a worse problem beyond the flashes and floaters, cataracts sure I have, I can not stand those damn floaters. I would to take this opportunity to express my sincere thanks and appreciation to you and your surgical team for the professional care and treatment I received during my recent retina surgery. Like most patients, I was somewhat apprehensive about my operation, especially the day of my surgery. My concerns were handled with such caring warmth and support from the moment I arrived, during my procedure, through post-op and until the time I left the facility. These days there is so much criticism about our healthcare system. I, inturn, had a wonderful experience thanks to you and your team. Everyone involved took the time to explain what was happening and what to expect. This level of professionalism, along with a caring attituide, has given me faith that our healthcare system isn’t totally broken. Congratulations to you and your wonderful team for a job “well done”. I wish you all continued success and all the very best. Many thanks for your kind words. I truly believe in surrounding myself with people better than me. Glad your experience was so positive! Hi Doctor Wong, I have suffered eyefloaters about 2 months ago, those floaters are really annoying, I’m very stressed. I have read a lot of article which are related to eye floaters and its seem like that Vitrectomy is the only cure to my problem. My floaters are thousand of small dots. I’m 21 year old and from Vietnam. I want a treatment to my floaters so badly. Could you give me some suggestion? Maybe in this summer I have chance to go to the US. Really sounds as if a vitrectomy is your only choice. I’d be happy to see you if you can make it to the U.S.
Hi Dr. Wong. Just arrived home after seeing you today. I truly can’t thank you enough for what you have done for me. Floaters all gone 13 days preop. I don’t believe people are supposed to see this clear. You are one of a kind in your profession. Your staff is probably the most professional I have dealt with and I have had expierience to deal with many medical professionals. The day of my surgery they made my wife and I feel totally at ease and comfortable. I have only dreamed of having vision this clear and you made it a reality and I sincerely can’t express how greatful I am to you. I am looking foward to seeing you in the near future for my additional surgery. Thanks for being so understanding and compasionate for people dealing with the nightmare of floaters. Very happy for you. Thank you so much for your kind remarks. Glad things have worked out! Hi Dr. Wong. I had an FOV performed by you on 12 April 2013. I just wanted to thank you for what you have done for me. All floaters are now gone 2weeks post op. I expierienced no pain whatsoever. I didn’t think that people were supposed to see so clear. You are truly unique in your field. All doctors I have seen have told me to live with the flaoters. I appreciate the fact that you take this condition seriously and don’t talk down to patients. As for your staff they were extremely professional and comforting. From the staff in your CEC office to the medical professionals at the Woodborne facility. They are to be commended for their expertise and professionalism. As for yourself I could never thank you enough. I will see you soon for the other eye. Once again thanks for being one of a kind in your field. It was indeed a pleasure to meet both you and your wife. I am so glad you’ve improved. Dr. Wong, My name is mike an I have pretty severe floaters that are very bothersome especially while driving at night. YOur surgery looks amazing and I would consider it but my Opthamologist tells me that this process can work but after 60-90 days the lens will basically cataract and that whatever is in the vitreous keeps your lens from doing that. He said no one has come up with an artificial vitreous that keeps this from happening. Please let me know your thoughts and experience with this. I have no idea to what your ophthalmologist is referring. Makes no sense to me. We are not looking for an artificial vitreous…..there’s no need. The vitreous is needed for development of the eye before we are born. After we are born, there is no practical use of the vitreous…we don’t need it. It may be true that a cataract may form after vitrectomy but there are many other factors…such as length of surgery. There is nothing inherent in the vitreous that prevents cataract…..everyone gets a cataract and not everyone gets a vitrectomy. I am 48 years old and have been told by my eye doctor (after an examination) that I have a partial PVD in my left eye. I plan to see what happens in the next few months to see if I can get used to it. If not and I decide to go ahead with a FOV, how do you treat a partial PVD? Do you have to induce the rest of the detachment? My eye doctor stated that it could take months or years for it to become a full PVD. Thanks. I don’t believe in long term PVD, it’s either separated of the optic nerve (that attachment is the Weiss ring) or not. But let’s say I’m wrong. If you’ve got a Weiss ring, it should be very easy to remove the floaters/Weiss ring. As a follow-up to my previous post, as a result of the partial PVD, I am seeing floaters (Weis ring per eye doctor). Thanks again. Please see response to other post. Hello from Hercegovina neer Croatia.An a mounth and half I get a PVD.It very bored especially one black dot in the top left corner of the left eye is very annoing and I sometimes think that craze beacouse her.My oftamologist said me that this situation is not change and I have this floaters all my life.My only choise is you doktor and seriously I come to America and finished this bad situation for me only with you.How much cost vitrektomy operation and how much time I must be there beacose that operation?Many people suffers in Europe beacouse floaters and that is very big problem unfortunately.Thank you doktor. I will have Chrissy and/or Andrea email you regarding an appointment and possible surgery. Hi, I live in the UK and an Optician diagnosed me with a Floater about a year ago. Since then it has increased in size and I have now lost approximately 95% of my vision in the left eye. I was wondering what would be your advice please? Not understanding your medical system, I’d get examined to make sure it is indeed a floater. From there, you’d need to make a decision. 95% seems pretty dramatic, but just make sure it’s in the vitreous and not something else. So my eye will just be hollow? Stuff won’t dry out inside? What if I get hit in the eye? Does the vitreous provide cushioning or protection? Basically, the vitreous is mostly water. I think about 94%. It is replaeced with 100% saline solution. Essentially a liquid is replaced by a liquid. The eye is not going to be hollow, just fluid. Thank you for this website as it motivated me to finally start dealing with my persistent and severe floaters (30 years duration). Four months ago I had a posterior vitrectomy to remove numerous floaters from my right eye. The first 3 months were fine with basically clear vision with the occasional small floater appearing. Then 2-3 large floaters appeared suddenly in a matter of just a few hours. I had the eye checked immediately and was assured no RD and the eye looked healthy. I was advised by my Doctor to wait at least 2 months to see if these residual floaters will settle. He assumes they were beneath the lens where he could not get at them during the operation. I will be consulting with him again in a months time but my question to you is do these residual floaters ever settle? Also , is there anything that would preclude having the procedure performed again as the new floaters are large and extremely bothersome , albeit that eye has only a fraction of the floaters that existed prior to the Surgery? Thank you again for your very informative website. If they haven’t settled after a couple of months, no harm in repeating. The floaters could have been from blood after the first operation, but should have been absorbed after a few weeks. In February I was diagnosed with asteroid hyalosis. The floaters started in December and rapidly proliferated over a couple of months to the point where I was really bothered by them. They stabilized for a while but over the past few weeks have worsened and gotten darker and now I’m having trouble reading. I’ve been to two eye doctors both of whom have told me I need to get used to them and that I won’t notice them after a while. Both warned me not to get a vitrectomy claiming the risk isn’t worth it. I’m not considering one right now but may in the future if the floaters continue to affect the quality of my life. They are causing me depression, currently. I’ve done lots of research on my condition and the vitrectomy procedure and there seems to be a lot of conflicting information. Some doctors are totally against ever having surgery while others claim scientific advances have improved to the point where they suggest getting one for bad floaters. I guess I wanted to get your opinion on when one should consider a vitrectomy. How long should one wait? And has the surgery improved enough where some of the risks has been lessened. Thanks for you time. Basically 25 gauge vitrectomy is as safe or safer than cataract surgery. Here’s an article I wrote regarding the safety of 25 gauge vitrectomy. 25 gauge vitrectomy with the Constellation system is the safest. There may be 27 gauge alternative shortly. Yes that certainly makes sense. I have not discussed a second procedure with my Doctor yet but I was curious about how long one should wait before deciding on that option. The floaters do not appear to be blood from the initial surgery as it has been 4 months now and the new floaters are still there. I am happy that you feel there is no harm in repeating the procedure. Thanks so much for your insight. No harm regarding a second vitrectomy. Thank you so much for all the detailed information you have on your website and in your webinars. It is very informative and puts my mind to ease having you discuss the problem along with the solution to the problem, since most of us have been discarded in the past to the severity of the problem. Saying this, I was just curious to know if you will be planning on hosting any more webinars in the future. I was on the back end of finding your website and missed being able to attend the webinars, but since they were so informative, you answered most questions that I think we would all have. Hope to see you soon to get these things out. Am thinking about having another one by the end of the summer. Need to find the time, but also trying to make this series just a bit different. Hello and thank you so much for this website and all the helpful information you provide to floater sufferers like me who are considering a vitrectomy to get rid of the floaters to end the agony of anxiety and depression they cause. I am 57 and first noticed mild thread like floaters about 25 years ago. They didn’t bother me much in the beginning but they have gotten progressively worse such that by about 6 years ago they started to really bother me all the time. Then 3 years ago I experienced a PVD in my left eye which caused a horseshoe tear which was lasered. I then had 2 other small tears in the left eye which were also lasered. The thread-like and cobweb floaters then became much more prominent and worsened over the next 6 months. I also developed large opacities that swish back and forth through my central vision like windshield wipers which are very difficult to deal with. Then a year ago, just when I thought I might actually learn to live with the mess in my left eye (I still had one good eye according to my doc at the time) , I suffered a PVD with retinal tears in my right eye which were repaired with laser. Just like the left eye, within a few months the webs and lines sloshing through my vision became much worse. Also, r for 3 months following, I experienced small retinal bleeds anywhere from 2 to 10 times a day (black thread shooting down then breaking up and dissipating into tiny specs within 1 to 3 minutes). My doctor could never find any new tears. Fortunately everything seems to have settled down with respect to the bleeds and the laser is holding. I also now have a very prominent Weiss ring in my right eye central vision shaped like a question mark. 1) Does having “significant” lattice increase the risk or make the procedure more difficult? 2) Does my history of multiple tears in each eye and persistent small bleeds that took 3 months to stop make me a higher risk for complications? 3) Having had PVDs in both eyes, would you then remove all (or most) of the vitreous and “peel” what remains attached to the retina? 4) What happens to the “flaps” of the torn retina which are still attached to the vitreous? Do they get trimmed off or separated from the vitreous and put back in place with laser to “fill the void”? 5) Does anyone know the long term effects a vitrectomy has on the eye and vision besides possible accelerated cataract formation? Thank you in advance. I am considering making an appointment to have you examine me for a vitrectomy. My retina specialist is very good but I’m not convinced he is the right one to do a FOV because although he does hundreds of vitrectomys a year, he does not do that many FOV procedures. I don’t know if that really matters or not. 1. I think having significant lattice in addition to a history of repeated tears and bleeding make you a walking time-bomb. I’d think vitrectomy could actually make you much more stable…..of course, in my opinion! 2. I think you are having complications from the PVD and constant traction or “pulling” on the retina. 3. I would be able to easily remove most of the vitreous. I wouldn’t be peeling anything, but would “shave” as close to the retinal surface as possible. 4. Yes, the adhesions are lysed (fancy word for “cut”). 5. At 57, it’s a moot point. You’ve been suffering for a long time, cataracts are inevitable and there is hope for stability and improvement.! Probably doesn’t matter, but I’d be happy to see you! please give to me your address so i can make a appt. I will have Chrissy or Andrea reach out to you. I don’t have any insurance and I don’t have the money to see a retina specialist. I went to the WalMart optometrist ($45) and he dilated my eye and told me that I have PVD but assured me the retina is fine!! That was Monday. Today is Thursday and when I woke up, I noted that I can’t see from the bottom half of my eye if I look straight ahead. I called the retina specialist who said the soonest appt they have is Oct 11th…which works for me BC I am getting married in a couple weeks and will have insurance by then. However, I’m very concerned about what’s going on with my eye. I don’t want to lose my vision. I believe this happened from being on the back of a motorcycle that is very powerful (1200). We stopped for gas and I had to take something BC my head felt like it was gonna explode, but I suffer from migraines and had had one for a week (on and off) at this point. On the way home from the bike ride, I had to keep switching my head from left to right and back again BC my neck hurt so bad. This is when I noticed the spots. That was labor day. The spots decreased, but my vision was still blurry. A week later, the spots came back and that’s when I went to the optometrist. That was Monday of this week and today is Thursday. The spots haven’t gone away and neither has the blurred vision or migraine. I don’t know what to do and I am getting very worried. If there IS retina damage, will I be ok like this until Oct 11th? What if it gets worse before then?? Is there anything I can do to keep it from progressing??? Can something like this happen from a bike ride, a heavy helmet, or long-term migraine and stress??? How can I possibly tell without examining you? Get examined and don’t wait for the wedding. About 7 months ago I experienced a Posterior Vitreal Detachment with flashes and weiss ring. After seeing optometrist I was referred to a retinal specialist.The specialist didn’t mention that I had an option of getting a Vitrectomy. Just told me not to go bunging jumping ( so I wouldn’t get a detached retina). When I returned to the optometrist he said yes the retina guy did FOV if i insisted but I would have to keep my head down for 10 days. Does he do a different procedure?? and if so why is one type of procedure done versus the other. Seems to me from reading this blog that most having FOV are up and moving around within 2 days. If I have an option i’d rather be out of commission for 2 days than keep my head down for 10. What determines the option? I am 65 – I have hint of cataract which optometrist said initially is the slow growing type and not likely to cause me a problem. 2. My patients are back at full activity in 24-48 hours, there is no reason to limit activity. Dr.Wong, how do you deal with highly anxious patients? I understand pre-operative versed or something, but what if a patient insists on general just to be totally knocked out. Also, in these types of patients, do you prescribe benzo’s to last a few weeks. Panic attacks, sleep problems, and stress are not beneficial for the healing process. I have had surgery before and this was my preferred course of action. Being poked in the eye is on a whole other plane of anxiety. Certainly we do surgery under general surgery. If you require it and it’s best for you, no problem. I personally do not prescribe “benzo’s,” but your primary care might be willing too. First time I have found your web sight. I have had laser in both eyes for torn retinas, first one was left eye in 2001. three welds, second one right eye 2003, two welds, have had floaters pretty bad ever since. Every Eye Doctor I went to told me nothing can be done for them. Have also had cataract surgery in both eyes. Your web site is very informative and well written and understandable. Despite your complicated history, a vitrectomy would probably change your life. It’s safer than cataract surgery, you’ve probably had a PVD in each eye and you’ve had cataract surgery. Best of luck and thanks for the plaudits. I am looking to see you about the possibility of FOVs. I live in Canada but prefer to visit you. Im not too sure about if insurance covers the procedure or not. Hopefully i can take a trip up. When you are ready, please email Chrissy or Andrea. They can help with insurance questions/issues. Words cant express the gratitude I have for what you have done for me,Its been a long difficult road and now im finaly free from this horrible affliction because of your skill and expertise. I can admit withought a shred of doubt you gave me my life back that floaters stole from me,you are the most sympathetic doctor and a great human being,its such a strange wonderful feeling not having these horrible things in my eyes anymore,you went far out of your way for me and I will sincerely never forget that. I cant speak for those of you out there on how bad floaters bother you but if they are causing you depression and ruining your life,Doctor Wong can help, he saved my life.When I was told by numerous doctors to live with them,Doctor Wong made it clear that I dont have to,The minds of the majority of doctors needs to change they need to understand that floaters truly ruin peoples lives. once again thank you and please dont ever stop helping people,theres so many other people still suffering. Thanks for your confidence. I am very happy for you. Thanks for sharing your success with others. Please stay in touch. I recently had a ‘core’ vitrectomy for floaters in the St. Louis, MO area. Everything has been great post-op for the past 3 months. However within the last 3 or 4 weeks I have been noticing a flashing phenomenon. I went to my surgeon for my three month checkup and she said everything looked fine and she was not sure what the phenomenon was from. -I only notice this flashing phenomenon when looking at a well lit homogenous surface, such as a white wall, or black pavement, and shift my gaze quickly up-and-down or side-to-side. -It only occurs when I am looking at these plain surfaces and they are within about 5 feet. -The bright flashing occurs throughout the majority of my visual field. I was concerned at first that I was experiencing traction, but because the flashing does not occur with my eyes closed or in dark conditions, I am pretty sure that it is not a neural phenomenon. Do you think this could be the ‘frill’ symptoms that people sometimes complain about? Have you ever seen anything like this? And was it able to resolve with time? I think this may resolve with time, as long as there is no tear in the retina. You’ve explored this possibility with your retina doctor. I don’t think it’s frill, or at least it is not the frill that I’ve experienced. It may be, in fact, be due to vitreous gently tugging on the retina. Having had most of the vitreous removed, you’ve got a change in vector forces/currents inside the eye. Hang in there. Best thing is… I bet you’ve got fewer floaters. I am planning to visit you for a consult. Could you please tell me that you are now more in favour of inducing a PVD for removing floaters? I must say I really appreciate that you are willing to improve your techniques and change the mindset. It shows that you care and are flexible for the sake of improving. Is it true that recovery time is much longer with PVD induction? My only fear is the FRILL issue. Other than that I think you are the best Dr. to have floaters removed. Is the price of surgery different as i reckon that PVD induction takes more time and has more risks? I am much more in favor of inducing a PVD than 1-2 years ago. Frill is NOT a complication of vitrectomy, but rather a disappointment though the floaters are gone. I think the best approach is indeed a PVD. Price might only be affected if anesthesia time is increased. So Dr. What about the risks with your new technique? I guess the risks are higher now for a tear when you induce pvd in a young individual. So how are your results with this inducing pvd now? This is not a new technique. Vitrectomy was invented in the late 1970’s. Technology has just improved the safety quite a bit. Risks of retinal tears are about 1-2% at most. I am a 29 year old female suffering from moderate floaters for over a year. They awful to me and I was wondering what the best way is to contact you to decide if a trip up North is worthwhile. I visited Dr Karrikhoff last year and he said nothing could be done because he could barely see my floaters and they were too close to my retina. But I see them all the time. Except when very dim/dark. They have impacted my work and my love for the outdoors, etc. I would love to speak with you about options. Sounds very likely that I’d be able to help. The best way to move forward would be through either Chrissy or Andrea. I’ll have one of theme contact you via email over the next few days. Im 25 an have been suffering from floaters for over a year now. I realize this is not as long as some people but I can honestly say I can’t live the rest of my life like this. Every doctor I approach does not seem to be concerned with this and says surgery is out of the question in regards to risk. Is this true? Also I find myself wondering how things would look seeing through water rather than this jelly material that is normally contained within the eye. Does it differ? I’ve started a website for floater sufferers. Please visit and subscribe? Here’s an article from there about the safety of vitrectomy or FOV. Dear Dr. I did not mean the new technique as in the vitrectomy. I meant the fact that for you the FOV for floaters will be more and more done with INDUCING a PVD. This is also not a new technique in general. But it is your new Technique and approach for dealing with floaters. My question is are u comfortable with inducing PVD’s in young people and what are the risks in your eyes for RD. In the past you always had arguments against PVD induction and for CORE. I want to know what are the arguments now that made you turn 180degrees. You have my full respect for this turn and courage. I know it is because you want the best for your patients. As you point out, I’m now more in favor of inducing a PVD, especially in young patients. I’ve had a few young patients in whom “frill” has really become a psychologic issue for them. Though the floaters are absent, the frill is bothering them even more. My best guess about frill is that their vitreous is indeed different, too. Thus, PVD is the best answer as it allows the most efficient removal of more vitreous. There are excellent techniques for creating a PVD to minimize the risk of retinal tears. My own experience is quite favorable with regard to minimizing the complications of retinal tears. Could you please explain what does “frill” mean? I mean when for people after vitrectomy this frill disturbs more than floaters before? What are the chances of that frill? And how to reduce them? “Frill” is not a clinical term but is used by certain patient describing an “edge” in their vision following vitrectomy. Curiously, it only develops in patients who’ve had FOV (vitrectomy for floaters) and NOT in patient who have undergone vitrectomy for other causes. In 23 years, I’ve never had a patient complain of “frill” after having vitrectomy for other reasons. You are right, many obsess over the “frill” though the floaters are removed. Moreover, this is viewed as failure though the floaters have been removed and the eye remains healthy. Chances of frill decrease with age. To me, as I said in a previous email to you, there may be two problems. The “frill” may only be realized after vitrectomy as there is now contrast between where the vitreous has been removed and remaining “abnormal” vitreous. Because of the above, I find myself inducing a PVD more often. 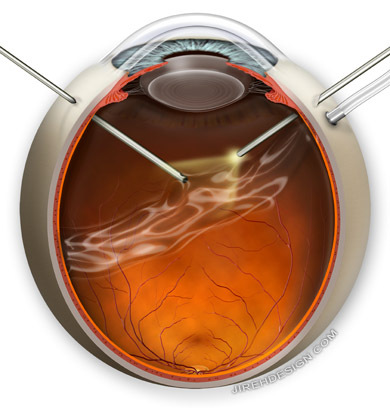 During the vitrectomy, the vitreous is replaced by artificial saline. This is replaced by your own saline within 24-48 hours. There are no known complications of this. I am not aware of any difficulties with using artificial saline during an eye operation: cataract or retina. it occur maybe a month year or maybe not, it would be great if you add brief information about that ? Retinal tears and possible during surgery. At the end of every case, your surgeon should look carefully for retinal tears that may have occurred during surgery. Retinal detachments resulting from a retinal tear usually occur soon after surgery. I am not from the states but i come to know about your practice through your youtube videos. I am extremely concern with issues regarding the retina since i have already experienced 2 torn parts of it. There are few questions which i hope you can answer to give me or rather the general population a sense of peace. 1.) If i normally already have floaters, how do i know it is time that i have to see a eye specialist. When people say a shower, what does a shower constitute? 2.) If i have a habit of moving my eyeballs up, down , left , right etc. constantly, does this movement causes the retina to tear since i have read somewhere that moving the eyeball causes the currents inside the vitreous to move. Hence, would it cause a tear? 1. Normally we recommend that a sudden increase in the number of floaters or flashes should provoke an examination. If the floaters have been longstanding and you’ve had an exam, probably you’ve done everything you can. Be aware of NEW floaters. 2. Your eyes are constantly moving when you are reading, walking or driving. These saccades are impossible to control. Also, tremendous movement occurs during REM sleep. So, no. Simply moving your eyes do not cause tears. My 17 yo son was diagnosed with asteroid hyalosis today. For the last few weeks he’s complained about seeing “rain drops” and “heat waves” except when it’s dark. This is a very young age to start living with this condition. The eye doctor told him to ignore it and his brain would get used to it. This is a tough case. Usually patients with asteroid hyalosis have no symptoms. The copious white “calcium soaps” suspended in the vitreous are sometimes so thick that it becomes difficult to see and examine the retina. It would be very difficult to determine if he has symptoms from the asteroid, but if he is “seeing things” he might benefit from a visit to a retina specialist. I personally would want to know if he can tell if the “rain drops” and “heat waves” seem to be moving with eye movement. If so, they are likely caused by the vitreous “swishing” to and fro. I am 37 years old. I am suffering from floaters too and I am interested on long term expectations after a FOV ? to remove that loosley, wobbling bag then? Or is this bag barely visible? * Are there experiences how long does it take in that to develop a cataract with 37 years? * Is somebody still a candidate for premium IOLs after FOV? of increased intraocular oxygen level. * PVD happens once. If you’ve had vitrectomy and a PVD is not induced, it may or may not be visible. Most patients with PVD do not notice floaters. * No standard time. Everyone gets cataracts. Cataracts are like grey hair…usually occurring as we are older, but can happen easily in young people. *Yes, candidacy for FOV and Premium IOL are separate. *Glaucoma – no one knows for sure, there is no proof, just conjecture at this point. My personal bias is that it doesn’t happen, that is, I don’t seem see a lot of glaucoma develop in all my patients who’ve had vitrectomy – for all reason. Thanks a great deal for the information you have on this site concerning floaters. I’m 33, my heavy floater onset came about 3 years ago and I was wondering if I would be a good candidate for the possibilities of treatment for them. I’m designer/photographer/visual effects artist and it’s greatly affected my profession/personal life during this period, I even moved my entire life from CA to the NY area because the visual noise from the skyscrapers help give me some relief. I saw 3 eye doctors, the first two didn’t care to sympathize with my condition, but the third did inform me they were caused by a clean, natural PVD in both eyes, so from what I’ve researched I hear that makes vitrectomies a lot easier, is that true? Performing a vitrectomy on a patient with PVD makes the operation the quickest and easiest. In addition, in my experience, if your floaters are related to a PVD, you’ll be very, very happy afterwards. pupils, so I wonder if they could be in the premacular bursa rather than in the viterous. If floaters exist in the premacular bursa area, could surgary still remove them? As long as what you see move “to and fro” with your eye meovements, then a vitrectomy should be very helpful – premacular bursa or not. I’ll attach and article from my other site about the premacular bursa being a concern only for laser. Basically, with vitrectomy, the premacular bursa doesn’t matter. Pain and swelling – I can’t answer this without examining you….my regrets. Can you have the FOV surgery if you have lattice degeneration? Vitrectomy/FOV is not impacted by having lattice degneration….a normal finding in many patients. how old are your young patients who complain of “frill”? The couple of patients I have who have “frill” are about 25-30. It’s why I advocate inducing a PVD. Hello. I have floaters in both eyes. Tried laser treatment but without good results… Planning to do FOV. Local doctors in my country aren’t sympathetic like you and doesn’t want to do it. Can I travel to US to have FOV with you? Also, interested in cost of operation for one eye. Except from floaters I have moderate dry eye and my cornea reacts very badly to anesthetic drops. Can this be a problem? P.S. I write here two days ago http://vitrectomyforfloaters.com/contact-us/ but still doesn’t receive an answer. Sorry about delay. Did not get your message from the “contact us” page. Seems to be working. I can only respond when time allows. I hope you understand. I will have Chrissy email you separately regarding costs and scheduling appointments. Moderate dry eye should not be a problem. We won’t use anesthetic drops during the operation. thank you for your very informative website. Following new lens implants, the lining of both retinas began coming down but remain attached to a small part of the retina. The vision recovery from the implants was excellent. But, I am plagued by huge floaters that prevent me from doing close work and sometimes driving especially at night. I was told that doing a vitrectomy for floaters was not safe due to some lattice degeneration. They are extremely sight impairing when I move my eyes to and fro ( exe: driving and checking my mirrors). They are like pendulums swaying to and fro, caused by the vitreous lining on the retinas still partially attached to the retinas. Is a vitrectomy possible with this condition? Vitrectomy is very safe with/without lattice degeneration. You are not getting good information. If there is any question about retinal detachment and lattice degeneration, laser treatment can be helpful either at the time of vitrectomy or beforehand. I am considering having this procedure done and am trying to determine which eye I should do first. My darker more annoying floaters are in my right eye and so I was leaning towards doing the right, but my vision is actually better in my right eye than my left. Eye doctors have told me that floaters are usually worse in the eye that is more nearsighted but for me that is not the case. Does this mean that my left eye will soon be even worse than my right? Or is it just a myth that you get more floaters in your most nearsighted eye? Hard to say, but if the floaters are worse in your right….consider going with the right. No way to tell if the left eye will change. Dr. Young, I’m Brazilian 31 years, many eye floaters right, I have no PVD, I follow your site to 2 years, and their website encouraged me to do the vitrectmomy, my surgery is scheduled for 4/28/14, the surgeon said that surgery is 98% reliable, but is worried that my surgeon will not induce a PVD will only remove the nucleus is located where the vitreous floaters, my fear is to stay with the “frill” and get even more depressed . He commented that not induce PVD to decrease the risk of dislocation and cataract, my question is what are the chances that I get the “frill” after the FOV, have until 27/04 to decide. How did surgery turn out? If i have a very thin retina, would eye movements increase the chance of a tear? i am afraid since i have a habit of trying to catch my floaters and in the process, tend to jerk my eyeball back n forth. would this movements aggravate or provoke a tear? I don’t think you are hurting yourself. Remember that during REM sleep, your eyes beat back and forth rapidly and forcefully. Hey randy its been a while,things have been great up until a couple of days ago,I noticed some visual anomalies in my left eye,im no doctor but I think I might be getting a pvd,I know one of your patients had this problem and he ended up betting it removed,im going to see an opthamologist to see whats up,I just wanted to know your thoughts? It’s possible that you’re getting a PVD. What symptoms are you having? I had flashes for a few days,and now I have floaters theyare semiattached,Idont have any tears,I got checked .I belive your assesment is right though. In one of the comments on this site, you mentioned a patient who was chronically infested with S. aureus, and got an eye infection after FOV. I’ve had S. aureus as long as I can remember, mostly in my throat, but also skin, etc. Does this mean I’m not a candidate for FOV? Do I have a significantly higher chance of losing the eye to infection? No, everyone has S. Aureus. This does not alter your candidacy for the operation. I’m interested to hear why you’ve started advocating for PVD induction during FOV operations. A core FOV, while presenting a higher risk of residual floaters or “frill,” seems to have demonstrated a much lower risk profile in regards to retinal detachment during the surgery. Many doctors present this as the reason for performing core vitrectomy for floaters. Additionally, leaving vitreous body against the retina and lens allows that vitreous to perform its role in consuming oxygen and preventing oxidation of the lens (http://www.ncbi.nlm.nih.gov/pmc/articles/PMC2683478/). I understand that any entry into the eye presents risks for endophthalmitis and/or hypotony, so you can make the argument to “get it all” while you’re in there. But since many patients may have their most troubling floaters removed by a core FOV, I see no strong argument for removing the oxygen barrier and peeling membrane from the retina in all cases de facto, especially in eyes under 40 that have no natural PVD and many years until cataract formation. Would it not make sense to first perform a core vitrectomy and then see if symptoms resolve? In my experience, patients who develop “frill” after successful vitrectomy are as obsessed with the “Frill” as they were with the floaters. It occurs only in the young age group complaining of flaoters. “Frill,” in my experience, is the boundary between cut/removed vitreous and remaining vitreous. Inducing a PVD allows me to remove more vitreous safely. If done correctly, inducing a PVD, can cause a tear, but the risk is not necessarily increased dramatically. Regarding your comment about residual vitreous and oxidation of the lens – this is only a hypothesis. Cataract formation is not necessarily increased in my patients who have had a straight vitrectomy (FOV). I leave the option of PVD up to every patient. You are right, a practical approach might involve performing a “core” and seeing what remains. Dear dr. Would you suggest fov to young people (under 30 old)? Im from italy and 26 only. Have my floaters since 13 old. Here in italy, oculists says kinda always that floaters have to be kept by patients, the only way is to bear them. There are so few medics who would operate with a fov, 99 of 100 medics are against such an invasive operation for floaters only. Italian patients are kinda overfullfiled with the same general answers and they dont feel understood by medics. Floaters are just seen as a disturb of vision by oculists, thats unbelievable since there are people who really suffer for those and their quality of life is so reduced. I cant understand if its because italian medical school is too old and not up to date but im just telling about my experience seeing so many desperate people gatering on facebook asking for a treatment. There is laser but often young people are not eligible due to the floaters near the retina, so the solutiom would be fov, core fov, but among the medics who can operate with fov, there are some who dont accept to operate young people under 30old that much. What would you raccomand to a 26 years old guy with no dpv and with medium high myopia both eyes ? To take risks with core fov? Which are the risks? Young people like me seem to live in a middle way situation, no laser but too risk with vitrectomy. So what to do… i cant wait till im 50 old to have my fov so to do it with cataract too. But iguess the riskof cataract doin it now would be high… i read that 27g fov will reduce that risk much. Whats your opinion doctor? I have successfully operated on teenagers – your age is not an issue. 2. Retinal tear which could lead to retinal detachment (probably about the same as cataract surgery, say 1% or so). 3. Cataracts happen to everyone – with or without FOV. 4. 27 g may be safer, but not on the market yet. I was wondering what would be the best way to reach your office for discussing FOV? I emailed the ‘Contact Us’ form two weeks ago but haven’t gotten a response. I assume that email sees tons of activity so no need to apologize either, just would like to start discussing my options. 27 year old male – severe floaters right eye that can be seen in all contrast backgrounds. If I squint this floater is very large! I’m guessing you sent an email that was improperly configured on “vitrectomyforfloaters.com” – ooops, my mistake. We also got hacked two weeks ago, but I think the above situation explains never getting a message from you. I’ll email Chrissy to reach out to you. You should here from her very shortly. I am 27 years old. I have been suffering eye floaters in both eyes since I was 15. The floaters are really bothering me and have a significant impact on the quality of my life. My local eye doctor said, “Your floaters are benign because the cause of your floaters is due to the PVD. You just have to live with them. Maybe they will disappear in the future”. It has been 12 years but my floaters are still in my eyes. I am really hoping that I can find someone who can help me. Thus, I discovered your websites and Youtube Channel early this year. Thank you for being so compassionate towards patients who have been tortured by eye floaters. And, thank you for the webinars about the treatment for floaters. I think the webinars are very helpful and informative. I am looking forward to meeting you in the near future to discuss whether or not I am a suitable candidate for the FOV surgery. Moreover, I would like to know how much the surgery costs. Please forward my message to one of your “Labron Jameses” for more information regarding the financial aspects of the surgery. I assume that the surgery cost might be different for me since I do not live in the United States. Lastly I have two additional questions regarding the surgery. After the Vitrectomy surgery, is it still passable to do weightlifting or other heavy exercises? Awesome comment! I get a chuckle everytime I think about the webinar the “Lebron” references. I’ll connect you with Chrissy via email. Weightlifting and other heavy exercises are fine after surgery. Stay well. You are welcome. I really appreciate this website and love to read through your comments. I have had some troublesome floaters in one eye ever since a PVD a year ago. My eye doctor recently sent me to a local retinal surgeon who does floater-only vitrectomies. After examining me he took an OCT scan and said that I also have scar tissue on the retina. He left it up to me whether to have the vitrectomy but said that when he goes in there he will also remove the scar tissue “so he doesn’t have to go in again 3 years later”. I’m scheduled to get the vitrectomy in 3 weeks but after doing some web research on epiretinal membranes I’m wondering if it is really wise to peel it off if I have no visual distortion. Does the operation become much riskier than just the vitrectomy? Tough question. I personally would remove the ERM at the earliest point you notice symptoms. As for risk, some retina surgeons are very, very comfortable with this and others are not. Thats’ the best I can tell you. Thanks for the compliments re: website and comments. First of all this is the best website I have found on the internet regarding my problem, so many thanks for creating this website. Can you please help me out with this case? I was hit by a squash ball 9 days ago and was referred to a retinal specialist. They diagnosed my case as vitreous haemorrhage and could not detect any retinal detachment or tear or PVD based on physical and ultrasound methods. However, the retinal specialist could not be 100% sure there was no tear or detachment of retina due to blood obstructing back of eye so I will be seeing the specialist again next week. He says he is very certain my vision will go back to normal. The blood is causing the floaters/blurred vision which will disappear over time in the course of 8 weeks. The immune system will produce white cells to clear the blood and thus vitrectemy is not required. According to one of your posts. “50% of vitreous hemorrhage, regardless of cause, does not resorb on own.” Does this mean it is most likely I need vitrectomy? My specialist says it will definitely heal on its own. He seems very confident. I currently have floaters and grainy particles obstructing my vision and it is very annoying. Improvement is very minimal and perhaps this is a very slow process. What do you think is the likelyhood of having a vitrectomy? (50% doesn’t sound so promising, perhaps this will increase with extent of trauma or cause?) Is it better to have it earlier than later? As I wrote, probably a 50/50 chance of the blood completely absorbing – time frame? It varies. The most important thing is that your visual prognosis remains 100%.